We happily take back the unopened or unused product for refund or store credit minus our shipping cost. 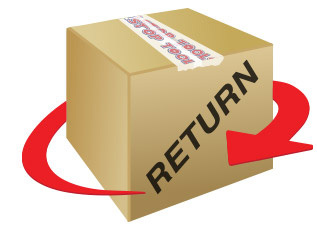 Please use the following procedure for any return or exchange: Place a copy of the invoice which came with your shipment in the package you are returning with an explanation for the return on the reverse side. Please indicate your preference for an exchange or refund. Send us an e-mail to let us know what's going on. Return the package to the address of the distribution center that shipped you the package. We are unable to accept returns of used or customer-damaged merchandise. Returns should be sent within 30 days of receiving the order. Any return request after the 30-day period should be authorized in advance by e-mail. Any items returned in new condition with proof of purchase will be refunded at full price less any shipping and handling charge. We do not charge a restocking charge for items returned due to our error and will rectify the problem promptly. We may charge a 20% restocking charge on items you exchange or just want to return. We will charge a 20% restocking on custom assembled items. Some custom assembled items cannot be returned.